As we get older and wiser, it seems like there is less and less time in every day. We'd like to think it's because we have become more mature and responsible, and have more important obligations getting packed into our schedules. But, we're pretty sure it has more to do with watching too many cute animal videos on our phones and also not paying attention to what time it is. Oops! Don't fall into those same habits like we have! You definitely don't want to be late for any obligation when you're in your costume, especially if you're all dressed up as the White Rabbit from the classic story Alice in Wonderland. The housing is sturdy plastic and the face is a sticker decal. It's fastened on a plastic chain and can be easily worn around your neck. 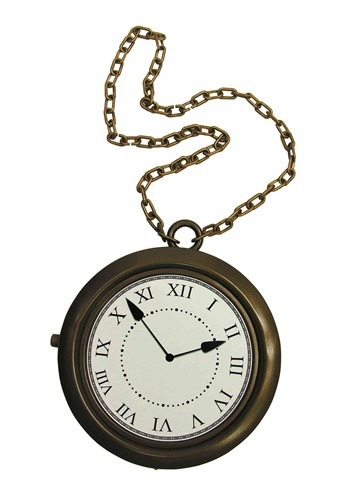 We should warn you that you can't actually tell time with this clock, but having this hefty faux-pocketwatch around your neck will keep reminding you to really check the time using your watch or your phone. Just don't get distracted by adorable kitten videos; it's an easy trap to fall into. It gets us every time! Perfect for my white rabbit -Alice in Wonderland costume!! Bought it with the white rabbit costume so it went hand in hand. Everyone loved it! Same quality as pictured. Large plastic clock with clock face sticker attached and it comes with the chain. Good price for what you get. This works wonderfully for our Alice in Wonderland play! Large enough to be seen by audience. Good price! A little bigger than expected but it will work fine.